It's a question that every author has to ask:do I need a website? For most, the answer is a resounding Yes, but that leads only to a barrage of more difficult questions: What sort of website do I need? What elements should it have? How can I use it to promote both my upcoming book and my backlist? How much of a time commitment must I make to updating the content and adding new material? How can I make it an organic entity that will keep expanding along with my career? And how in the world do I do it? This short book is intended to answer those questions and more, and serve as your guide to getting started, whether you're working with a designer or building it yourself. This is not a technical manual (it contains one single, solitary, piece of technical instruction), nor is it a marketing primer that aims to tell you how to make your website a success through strategies like search engine optimization and creating keyword-rich page descriptions. There are many good books and articles about those subjects (and I've included a brief list with links in the Resources section). Instead, this book is designed to start at the very beginning of the process: to guide you as you think through and craft a vision of what makes sense for you, and your very particular, unique body of work, on the Internet. What I hope you'll find here is the Big Think, both a philosophical and a practical approach. But before I get started I want you to stop for a moment after that first question – do I need a website? – and honestly wrestle with it. I'm not going to try to talk you out of it – if you've gotten this far you probablydo need a website – but I want you to play devil's advocate with yourself because in doing so you will begin that all-important process of framing your vision for how you want to develop your presence on the web. There are many ways of "being" on the web that don't involve a website, from social networking to blogging on an existing website platform like Blogger or Wordpress. So asking yourself two simple questions at the outset – do I need a website? and, if so, why? – will serve the valuable purpose of focusing your mind. Let's begin with the reasons why you might not want to expend the valuable resources of time, energy, and money on a website. You are humbled and daunted by the numbers, which suggest you'll end up a lost soul in the wilderness. According to Bowker, the country's leading provider of bibliographic information, there were 288,355 new books published in 2009 by traditional publishers in the U.S. and 764,448 by self-publishers and micro-niche publishers, for a total of more than a million books. (The latter number includes a huge quantity of previously published books that are now in the public domain.) The number of traditionally published books actually fell a bit. But overall the number of books released during 2009 rose a staggering 87%. According to Netcraft, an Internet monitoring company that has tracked web growth since 1995 (when there were just 18,000 websites with domain names and content on them), in 2009 there were 215,675,903. Surely you know how hard it is to attract attention to a new book (which is part of the reason you need a website). Looking at these numbers you have to ask yourself: isn't it likely to be even harder to attract attention to a website? I think the answer is conditionally yes, with caveats that relate to how smart you are about building and using your website. That's what this book promises to help you with. So the numbers shouldn't deter you; instead, they should sober you right up and get you more focused. The online landscape seems to change every six months and you wonder how you'll ever keep up. As I write this book (in Spring 2010) the last major writing trend, traditional blogging, has given way to microblogging, in the form of Twitter and Facebook. Facebook alone has more than 400 million users and is competing with Google for the amount of traffic it sends to major portals like Yahoo and MSN. And the way that we read books is undergoing a sea change as new electronic devices that enable reading e-books begin to proliferate and gain in popularity. Even before Apple released its iPad and iBookstore it was reported (by the mobile device advertising agency Mobclix), that the number of e-book apps (27,000) in Apple's iTunes App Store had surpassed the number of games (25,400 games). Barnes & Noble has the Nook; Sony continues to improve its Reader; and Amazon has a free app that lets anyone access its Kindle storefront without owning the expensive device. Other devices – tablets, netbooks, souped-up mobile phones and who knows what else – are on the horizon and they too will alter the way we connect to content on the web. Less than a year after this book comes out I'll have to revise this paragraph to account for a new wave of developments and innovations. So: as the world of technology constantly changes and evolves, how can an individual author stay relevant and up-to-date on the web? You are a writer, not a webmaster. How are you going to manage to write and promote books – with all the dedication of time and energy that those two enterprises require – and keep a website fresh and interesting? And if it's not fresh and interesting – meaning constantly updated with new material – won't people bounce right off it? These are all important questions but they have a deceptively simple and common-sense answer. Your grandmother would give you the same advice that I will: Be prepared. Be adaptable. Be authentic. I believe – and my experience bolsters that belief – that achieving success on the web has as much to do with careful, focused, honest thinking and a mindful, step-by-step approach, as anything else. It's a process I aim to help you with in the pages that follow, in the tradition of a good, old-fashioned editor. If you're contemplating a website you may find yourself in one of the following scenarios. You have a new book coming out in a few months and you need to be on the web. Perhaps you don't have a lot of resources of time, energy, or money; you just want to get something up that will properly represent the book and enable people to find you on the Internet. Maybe you're an author who has published books before and you never quite got around to creating a website. Or perhaps you didn't feel you needed one, you didn't understand what it could do for you, or it was so long ago when the last book came out that you were still using a typewriter. Or maybe you’re a young journalist and this is your first book; you want to do everything you can to give it a shot, and you want to enable and amplify the efforts of your publicist as much as possible. Or maybe you're self-publishing your book and don't have the benefit of a publisher's muscle in the marketplace; you want to do everything you can to give the book its best chance at success. You've published several books, were early on the web and created a site that, at the time, worked very well for you. But that was years ago, and your publisher/freelance webmaster still controls everything – you can't make a single change on the site without contacting him. Now your publicist/webmaster has moved on to other things and frankly he's not terribly responsive. You want to basically replicate what you already have – not reinvent the wheel with bells and whistles – and then be able to control all the content you post and develop some new features that might enable you to attract new visitors. You want to begin again, but this time with the ability to use the website as a tool that enables you to do many things, from publishing new material to creating a community and connecting with your fans. You've dipped your toe into the online world – created a Facebook page, started Tweeting – and now you want to organize your efforts and be more strategic. A website or blog is one place where you can bring all your online activities together, and once you've attracted someone's attention through a status update or a Tweet you can bring that person to your home on the web where she can discover your latest book. My first goal in this book is to get you to think like the author of your website. Instead of regarding it as a "web project" that puts you way outside your comfort zone, put your author hat back on and approach it as you would a fairly complex and detailed book proposal. What you need to do is summon all the deliberation, care and planning that you bring to your writing – and your outlining, positioning, drafting, editing, re-writing – to the project that is your website. The good news is that creating a website is a lot easier and faster than writing a book, and it gets easier every year as new technologies develop to enable even the most ardent of Luddites. You simply have to draw on the same skills that you've developed as an author, and you need to ask yourself many of the same questions at each critical step along the way. I speak to writers every day about their websites and I always ask the same questions I posed above (and many others that will follow in the pages of this book). I'm always surprised at how liberating and enlightening they find the process of thinking about a website in the same basic way they would think about structuring a book or creating a proposal – something they do know how to do. So forget about the fact that the web is a technology you can't possibly understand and think of it instead as a platform for distributing your ideas – like a book – and reaching your audience – like a good publicity and marketing campaign. Once you do that, you'll realize how much you already know about how to do this. I've spent a lot of years building websites, but at heart I consider myself an editor. I started my publishing career in publicity (at Random House), and as I evolved into an editor I did so with one part of my brain devoted to the enterprise of positioning and "selling" an idea, and the rest dedicated to the finer arts of narrative, expression, and development – the stuff I learned as an English major in college. In this manual I'm going to lead you through the process of thinking through your website by starting at the very beginning: with the content. If you start there and always pay homage to its importance and preeminence, you're going to do yourself proud. I try to avoid clichés in my writing, and urge my authors to do the same. But indulge me here. A word about this before we dive in, which is intended to embolden you. Over the past few years it has become extremely easy to create and maintain a website or a blog. There are many excellent options out there, from traditional website-building tools like Sandvox, a program I've used myself and admire greatly (it's available only on the Mac and comes with blogging features built-in), to pure blogging platforms like Wordpress and Blogger, which enable a non-technical person to create a blog or (by turning off the comments section) a blog-that-looks-like-a-website. If you're an offline do-it-yourselfer you'll know what it means to imagine what the world was like before there were retailers like Home Depot, Lowe's, or the Garrett Wade tool company; television networks like HGTV and programs like "This Old House"; and publishers of high-quality how-to books like the Taunton Press, Sunset and Reader's Digest. All those companies created accessible and affordable pathways for non-professional people to build things themselves – to take control of an essential part of their domestic lives – and in so doing they changed the way many of us inhabit our world and they unleashed waves of untapped potential and creativity. Today the Internet abounds with similar opportunity for people who want to create their own online presence, whether through microblogging (Twitter, Facebook), creating a traditional blog or website (Sandvox, Wordpress), or self-publishing and marketing their own book (Lulu.com, CreateSpace,.com, Blurb.com). Or doing all three. The tools and programs to get you started – and evolve into a master, if you're so inclined – are easy-to-use and widely available. Alongside that explosion of opportunity has come another essential development: the proliferation of information that a layperson can easily access, understand, and use to create, refine, and expand his online world. And because much of the technology and programming for building websites evolved out of the open source movement, much of what you need to get started is free. Moreover, it's constantly updated by professional developers who are motivated by a passion to continually improve the web and enable all of us to use it in new and more creative ways. Often the changes and refinements come from comments or complaints made by regular users on message boards and in user forums – people like you and me. It's a constantly evolving, constantly improving landscape. 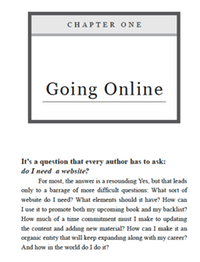 I decided to write this book because not a week goes by that I don’t hear from an author, editor, or literary agent with the request for help and advice about building a website. It turns out that most authors – and indeed most agents and editors – simply don't know where to begin. So I thought: why not download everything I know into one short book and keep updating it as time goes by. Then I can help everyone, a goal I've nurtured in true Panglossian form since I was a teenager. Also: it became clear to me that many of the people who were calling me needed something quite simple: either an online presence to support a new book that was just coming out or a very basic "home" on the Internet where they could present – in one place and in their own voice – all the information about themselves and their work that they wished to. They didn't need a project manager and in many cases they didn't even need a design or programming partner. With the right kind of guidance they could do it themselves. What most authors need is help deciphering the road ahead, and a way to frame the larger conversation about who they want to be on the web and how to get there. Building a website yourself is also, I daresay, fun. I was speaking to an author friend whom I greatly admire, Amy Krouse Rosenthal (more about her web projects in Chapter One) and she told me a story about how her mother gave her "a fun box" when she was a kid. It was filled with magic markers, a ruler, different colored pencils, an eraser, and a nice stack of heavy paper. She would spend hours making and drawing things. Today, as someone active online, she thinks of the web as one giant fun box, filled with tools that will let anyone who has a bit of patience, curiosity, and determination, create a place for themselves on the Internet. An example of a tool she found and made creative use of is Time Toast, a free plug-in that lets you create and share timelines. With this simple tool she was able to represent the narrative of her film, The Beckoning of Lovely – which was a community effort that involved hundreds of strangers from around the world – in another dimension, going beyond the simple video clip. Another benefit to doing it yourself is that once you've built a website you quickly realize that a whole new world is waiting for you--one that's filled with data and information. Harnessing and taking advantage of the tools that deliver all those rich data is just as achievable to you as building the website was. For example, once you get your site launched you can start using – for free – Google's powerful Analytics program that will give you invaluable information about who is coming to your website; where they're coming from; what content they read; how much time they spend on each article; what part of the country or the world (down to the city and state) they come from; and much, much, more. Why is this useful? Say you're a self-published author and you're planning to load up a few cartons of books in your van and hit the road on your own publicity tour. If you've had a website or a blog that's gotten some traffic over a meaningful period of time you can drill down in Google Analytics to find out which cities in the country send your website the most traffic. So when it comes time to making the decision, Topeka vs. Phoenix, you can let the data inform you. If you have a publicist working with you she can use your data to guide her priorities in terms of pitching local radio stations and other outlets. You can also use Google's AdWords program to promote your site and its AdSense program to accept ads from businesses and make some money. (More on taking advantage of these programs in Chapter Four.) Email service providers – companies like MailChimp and Constant Contact that manage e-newsletters for individuals as well as large companies – have similar analytics programs that allow you to mine data about who is reading your e-letters; where they live; which links yield the most clicks; how you are doing compared to others in your industry category (investing, health, parenting, entertainment) and more. Once you start using these services you may be awed, as I was, by the high quality and quantity of Help documentation that these companies provide about how to use their products and, most important, how to make them work for you. Message boards and forums are another great source of information for problem-solving and finding new features you can plug into your website or blog. These, like the open source movement, grew out of a powerful impulse that drove many developers and early Internet pioneers to collaborate on web projects and improve programs, systems and tools for everyone. I find it both comforting and energizing to know that there's this gigantic safety net of help and information that's waiting to catch me once I slip. And slip I do, all the time. Smart technology companies, whether big ones like Google, GoDaddy and Apple or small ones like Karelia, the maker of Sandvox, have top-flight support departments that can offer additional help if the documentation on the web doesn't suffice. So even though you may spend most of your time writing in your garret with your dog at your feet, you are not alone. You do, of course, have to want to build a website, and you have to make a deal with yourself to be patient and expect some frustration. But the tools are out there, and with a bit of study and trial-and-error, they are pretty easy to master. What this means is that you can start small and simple, and then grow slowly with feedback from visitors and new technology developments that will enable you to do more and more. That's a new thing for authors, and it's worth getting excited about. Note: I sometimes use the words "website" and "blog" interchangeably. I do this because you can turn off the comments on a blog and it becomes, to a great degree, what we think of as a website. Of course there are differences between the two, but the free blogging platforms are often sufficient for many people who just need a simple website.